13.07.2018 : The RRB has Released the Link to Check Application Status… Candidates Can Check there Application Status from the Below Provided Link…..
Indian Railway invites applications in the Prescribed Format from eligible Indian Nationals for the 26502 Posts of Assistant Loco Pilot (ALP) & Various posts of Technicians through the Railway Recruitment Boards (RRBs). Many Candidates Filled there Online Application Form. The Process of Submitting the Online Application form is Started from 03.02.2018 and Will be Conducted till 05.03.2018. More Details about the Recruitment is as Provided Below. The Railway Recruitment Board (RRB) will soon release RRB ALP admit card & RRB Technician admit card 2018. Recently, RRB had published the RRB ALP recruitment notification on its official website - RRB, for which the online application form has been closed. This time, the Railways has released total 26502 vacancies out of which 17673 is assigned for RRB Assistant Loco Pilot (ALP) and 8829 for RRB Technician. The next process of recruitment is the RRB ALP admit card download, which is expected to be out 10 days before the Computer Based Test (CBT). Most likely, the RRB Technician & Assistant Loco Pilot admit card will be out in the month of August/September 2018. The RRB ALP exam date 2018 is not yet announced by the officials, but it is expected to be out by the month of June 2018. The final date to download the Railway ALP admit card will be announced on the official site for CBT 1, CBT 2, Aptitude Test and Document Verification. Candidates who have filled up RRB ALP online application form can check the RRB Loco Pilot admit card details. How to Download RRB Admit Card for ALP/Technician Exam 2018? Candidates applied for the Railway Loco Pilot can check below the step by step guide to download the hall ticket. You can use these steps once the admit card gets live on the official site of RRB. Step 5: After you enter your details, you will see your admit card on the screen. 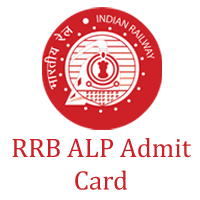 Download your RRB ALP admit card. Step 6: Take out the print of your admit card for future use. Option for Railway/Unit & Posts, Selection of Exam Trade and Confirmation/Modification of Bank Account Details for Refund for candidates appeared in 1st stage CBT for the post of ALP & Technicians under CEN-01/2018. is live Now to 1st October 2018, time 23:55 hrs. Share this article if you Love it !